"GWU WE HAVE ARRIVED! On campus- parked on 22nd right at the corner of H st. And ready to cook your lunch! Open fro... https://t.co/usuFM5LGiU"
I usually order the Marco Bolo which is GREAT!!! (Better than bolognese in most restaurants) Today, on recommendation of the server, I tried the Classic Sloppy, which the the classic Mac n cheese but with the bolo sauce on top. Another home run! This is consistently one of the best food trucks in DC! I'm a harsh critic of Italian food, so when I heard the raving reviews of the MarcoBolo I decided I needed to give it a shot for myself. It was delicious! The bolognese had great flavor. The box may look little, but don't worry- there is plenty of food to fill you up... and some! The Marco Bolo is awesome; very tasty and you get a lot for your money. This rivals any bolognese I've had in a restaurant, if not better! Delicious! The macaroni and cheese was gooey and cooked to perfection. Some sweet corn was mixed in and it tasted great. The mac and cheese with corn was topped with bread crumbs, which added a nice crunch. I wasn’t planning on paying $12 for lunch, but since the portion size was large, I am saving half for lunch tomorrow. Orders are taken efficiently, and they even give you a fork and a napkin. Not all trucks provide utensils and napkins. Great truck! I hope they’ll return, so I can try their other offerings. The food was not good at all. I was expecting home-made macaroni cheese with lots of gooey cheese. This mac and cheese was more like the boxed kraft macaroni and cheese but I actually think I would prefer the kraft :/ The cheese seemed to be primarily velveta! I was highly disappointed and will never return. PS- the crumbled cheezits are not a great idea either! First of all, I am an avid food trucker. AND I get so excited when I see CapMac coming! I'm certainly glad I do not live in the Silver Spring area where they deliver....I would be HUGE. I've tried it all here, and have never been dissapointed. The pasta is always perfectly cooked. The meats always flavorful and delish!! OMG .... This was my first time at CapMac. I ordered the Marcobolo, which is kind of like a bolognese. This is OUTSTANDING! Very tasty; perfectly seasoned. Very filling (don;t let the small box deceive you). This was my first time, but definitely, not my last! Second visit, and still pretty pleased; the Marco Bolo was absolutely delicious, despite, not seeming like much to look at. Only disappointment was that the already small box wasn't even full; it was packed to the brim last time. Gotta dock it a star on value for that, but still, I'll absolutely be going back to CapMac. top notch truck. one of my favorites and delicious food. wish they came to my location more though 🙁 Show Navy Yard more love Cap Mac! The line is long, but the wait is so worth it! Boxes filled with deliciousness. I am a new convert and totally addicted...oh my! MarcoBolo has perfectly cooked pasta with the best meat sauce, so flavorful and tender. Love it! Boxes look little, but packed heavy and quite a hearty meal. 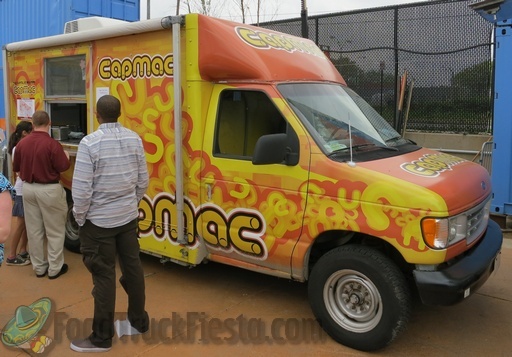 Cap Mac brings gourmet pasta to DC’s food truck scene. 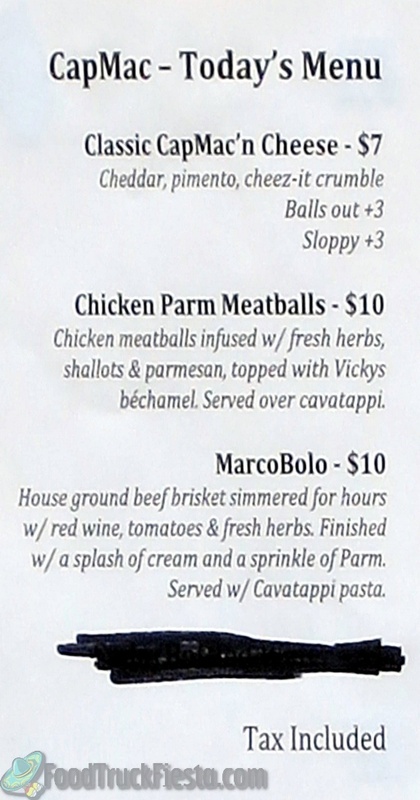 Menu items include mac and cheese, chicken parmigiana and lasagne. Cap Mac’s soft opening occurred on November 15, 2010. In early 2013, CapMac announced their nightly delivery service for Silver Spring addresses. The hours of operation are Tues-Sun 5pm-10pm and the menu and ordering info can be found here. After a brief retirement, CapMac relaunched in march 2014 under new ownership!